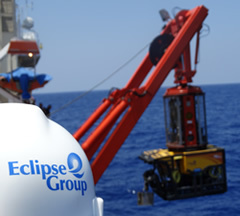 The Eclipse Group delivers innovative subsea services and solutions to clients worldwide. Eclipse Group, Inc. (EGI) is a marine operations service provider based in Annapolis, Maryland. We provide turnkey subsea technical solutions to both commercial and government customers worldwide. EGI is focused on targeting both federal and commercial business opportunities in which EGI has specialized knowledge, that will inherently serve to grow our reputation as a leader in deep-water operations. EGI’s organization has highly skilled personnel to include: program managers, project managers, operations personnel, engineers and supporting administrative staff who share a commitment to planning, organizing and executing complex at-sea operations. EGI personnel average 23-years’ experience in subsea, marine operations and engineering providing our customers the technical edge needed for successful maritime operations. EGI has preferential access to Dynamically Positioned (DP) deep-water dive support vessels, support equipment and staging yards, enabling our team to quickly mobilize and support high-priority missions. These staging yards are strategically located in CONUS Pacific, Atlantic ports also including Asia and Mediterranean ports with direct access to a wide variety of subsea assets including ROVs, survey and navigation, cable installation and burial equipment, heavy lift and deployment equipment.